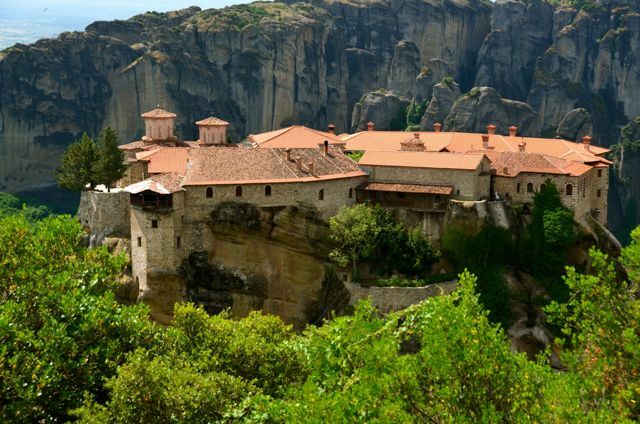 In an age of sophisticated construction equipment, it’s easy to take the building of the Meteora monasteries for granted. 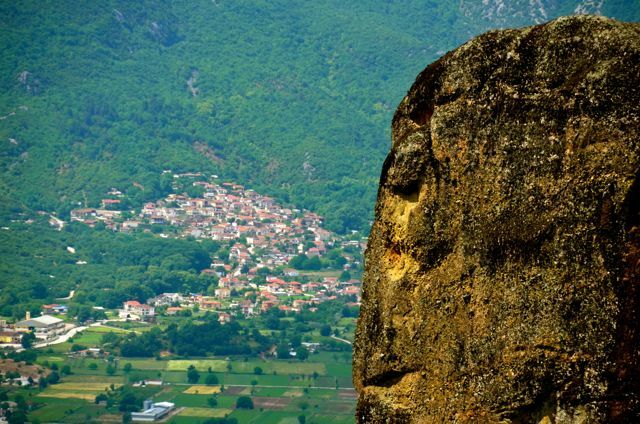 Yet, imagine how difficult it was to carry the building materials to the peak of the mountaintops centuries ago, which are on average 300 meters (or 1,000 feet) high. 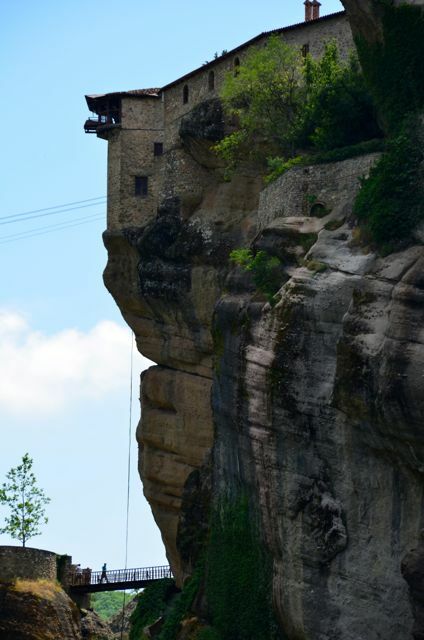 And, consider the challenges monks faced in getting themselves up there. With no staircases as there are today, they rode up in nets, surely relying on their faith to banish any terrifying thoughts that the rope on which their life depended might break. When approaching these magnificent structures for the first time, Shawn and I decided to take the traditional approach – on foot. 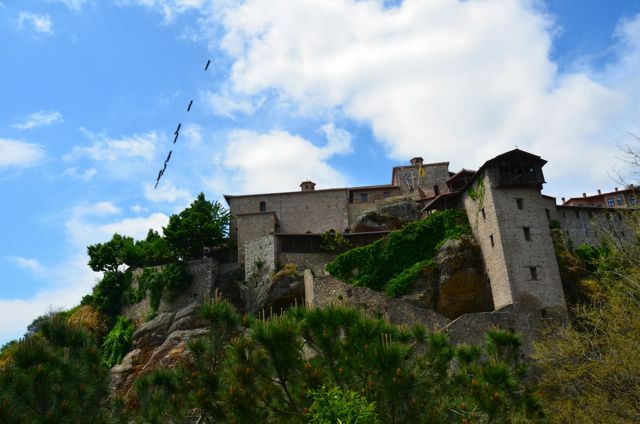 Starting on our journey, we met a few creatures along the way – most notably a tortoise and viper snake – and were eventually rewarded with glimpses of several monasteries high above us. Yet, with the evening hours quickly approaching, and being uncertain which path to take, we decided to turn back. 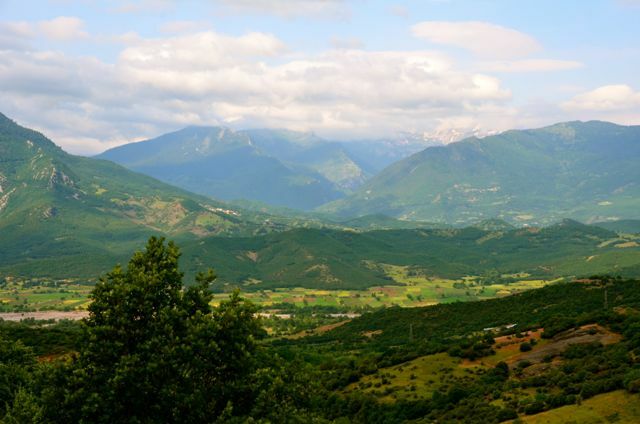 Stunning mountain scenery and patchwork quilt-like tracts of land. 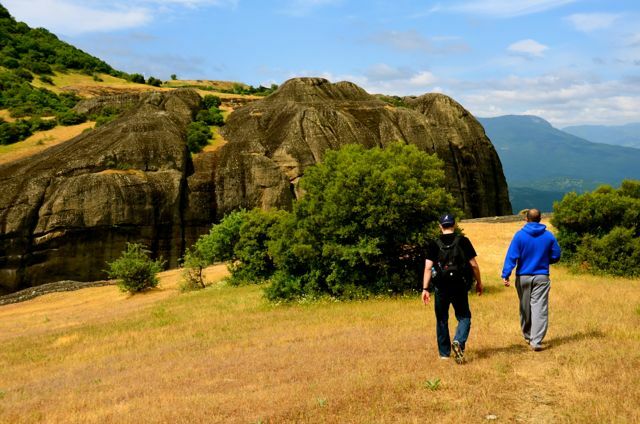 The next day, our energetic tour guide, George, from Visit Meteora led the way and literally took us off the beaten path as only a local can do. 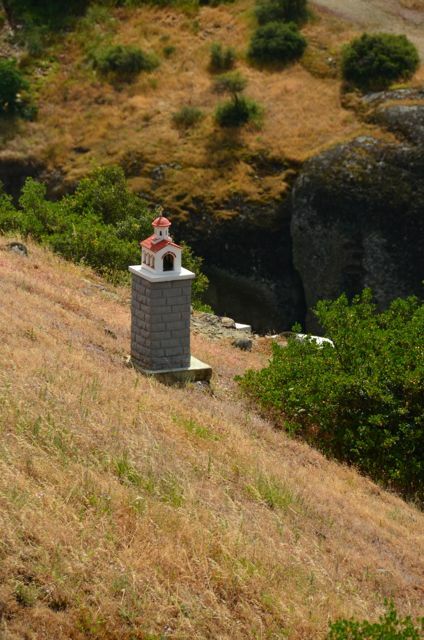 During an overcast morning, we passed a kaleidoscope of wooden beehives, a shepherd and his flock, and a small prayer shrine. 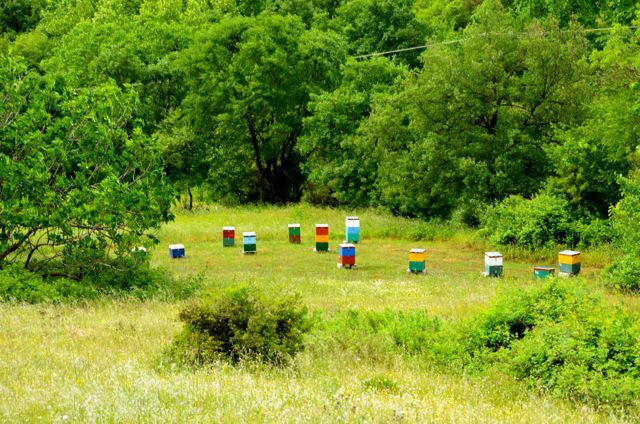 A kaleidoscope of wooden beehives. 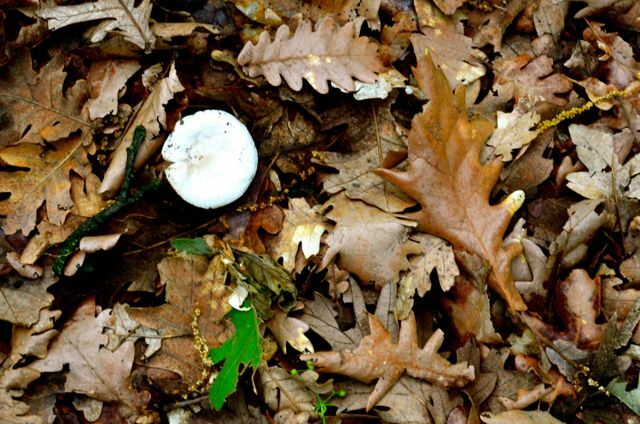 A mushroom emerges from a bed of last year’s leaves. Soon, the clouds burned off, exposing aquamarine skies, patchwork quilt-like tracts of land, and snow-capped mountains. 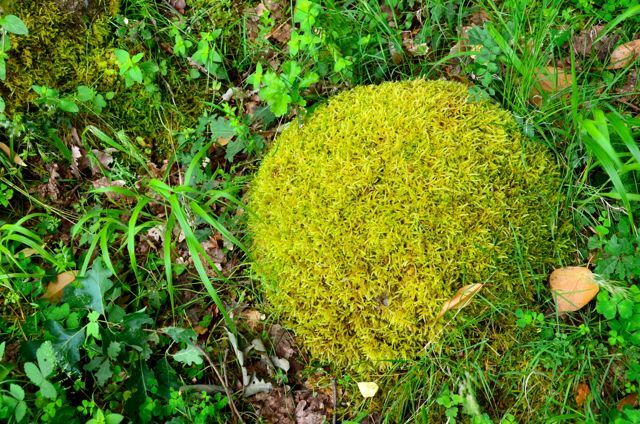 We wandered off a bit away from the rock formations, into a lush forest filled with a plethora of wildflowers, areas carpeted by shag-like moss, and mushrooms. Tank-like beetles, mammoth-sized wasps, alien-faced grasshoppers, geckos and industrious ants also made their presence known. 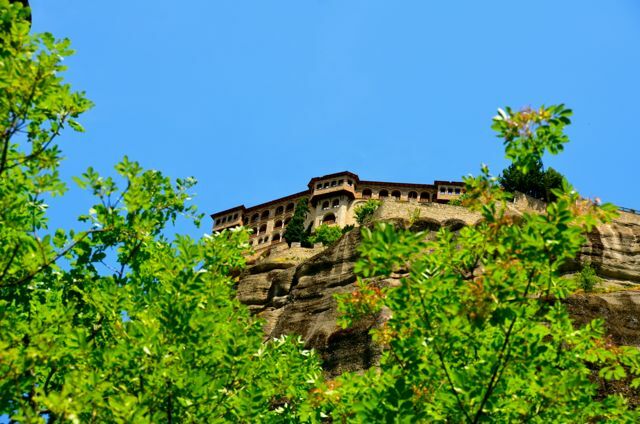 As we wound through an oak tree’s branches, we spotted a monastery that most visitors to Meteora never see – the Ypapanti Monastery. 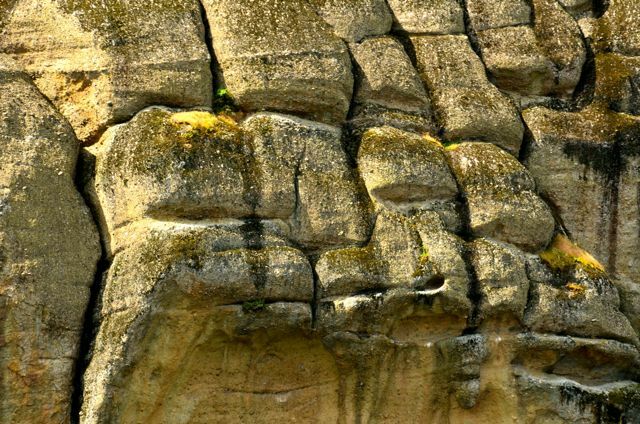 It doesn’t sit atop rock formations, rather it appears to be clinging to the side of one. 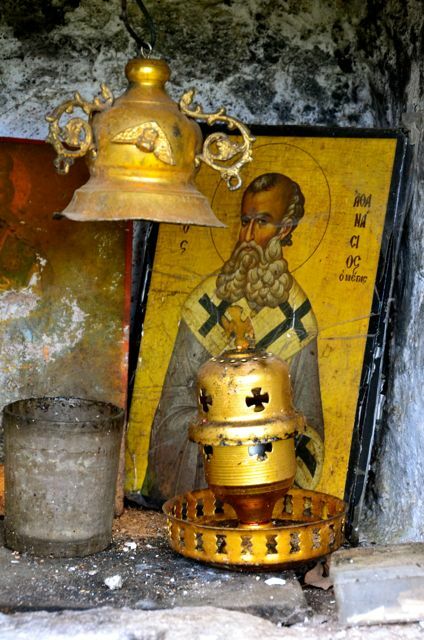 George explained that the Ypapanti Monastery is one of several monasteries that is no longer active, and presently closed to the public. Hiking a bit farther, we approached an odd landscape, realizing that we were actually now walking atop some of the rock formations. Sections of the mountain were smooth, whereas others had straw-colored grass. 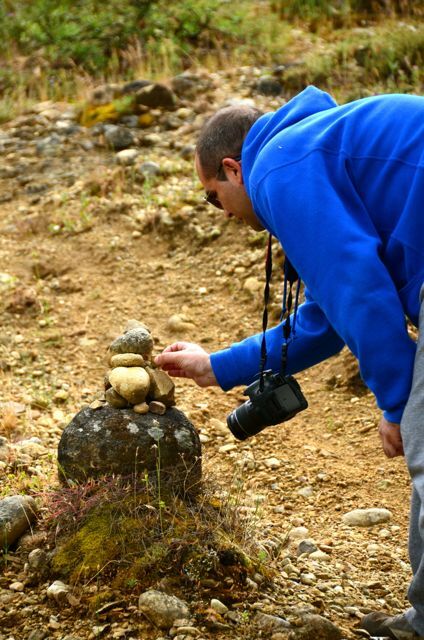 George stopped to add a rock to a makeshift tower, a custom that we’d later see practiced on hiking trails elsewhere in the country. Shawn and George walking atop one of the rock formations. 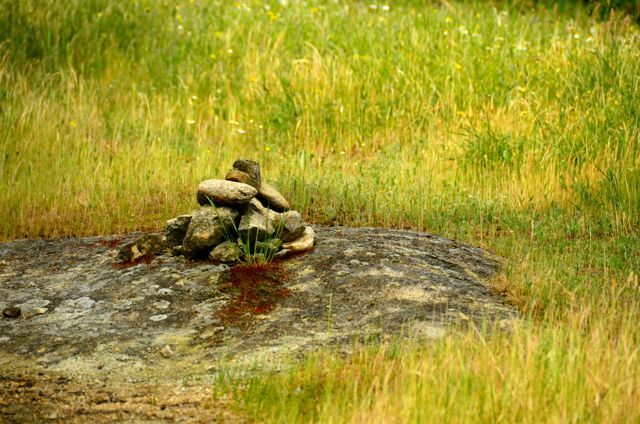 One of many makeshift rock towers created by hikers. Like children playing the ‘cloud game’ (seeking to find familiar forms in the clouds), we tried to make out faces and shapes in the rugged rocks. Then we just took in the serenity of the spot. We were the only people in sight. Birds soared overhead, showing off their ability to flit from one precarious boulder top to another. There were no other people in sight. As we continued our trek, we caught glimpses of three additional monasteries. 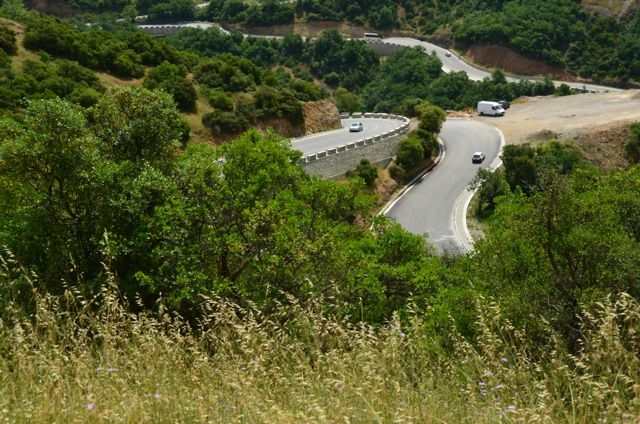 Having been surrounded by nature for the past hours, it was jarring to see tour buses whizzing by, and visitors being hurried from monastery to monastery. On the stairway leading down toward the Great Meteoron Monastery, we glimpsed thousands of caterpillars rappelling down from the trees, building chrysalises. It seemed fitting that the insects swung on silk cords in the foreground of the spot where monks once rode up to the monastery in a rope basket. Caterpillars’ silken cords swaying in the breeze. In past centuries, monks rode up in a rope basket from this tower-like structure. Today, the lift is only used for the delivery of food and supplies. 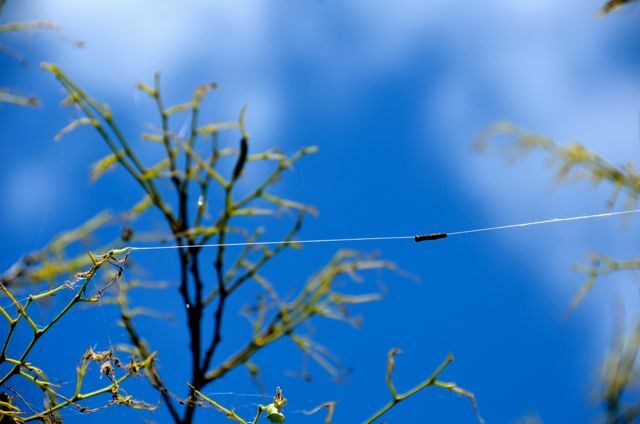 Several caterpillars tried to stow away with us during the hike down to the village of Kastraki. 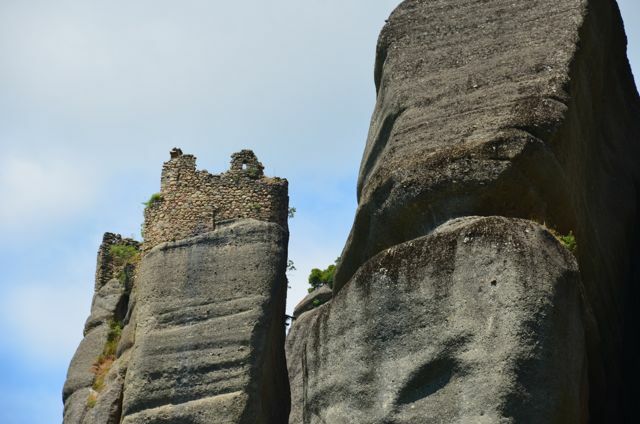 On the way, we also spied ruins of monasteries that once graced the boulders’ tops, as well as just two of the many adventure seekers who regularly climb these rugged rocks. George had given us the option of touring some of the monasteries’ interiors, but we decided to save the interiors for the next day. We wove down a well-shaded trail back to our home away from home, on paths covered by twisted roots, and an occasional glimpse of the majestic monasteries now overhead. A monastery’s ruins. 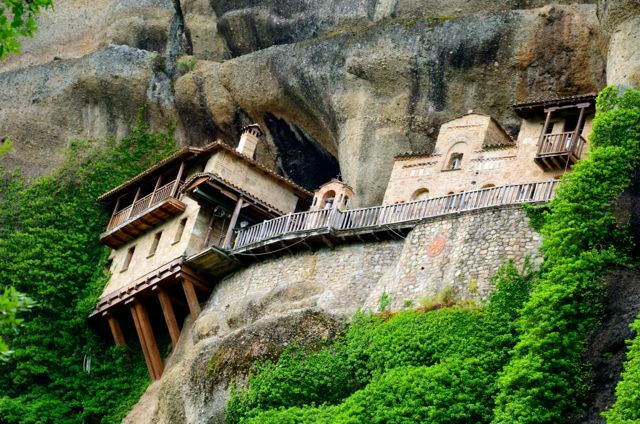 Centuries ago, there were more than 20 monasteries built upon Meteora’s unusual formations. 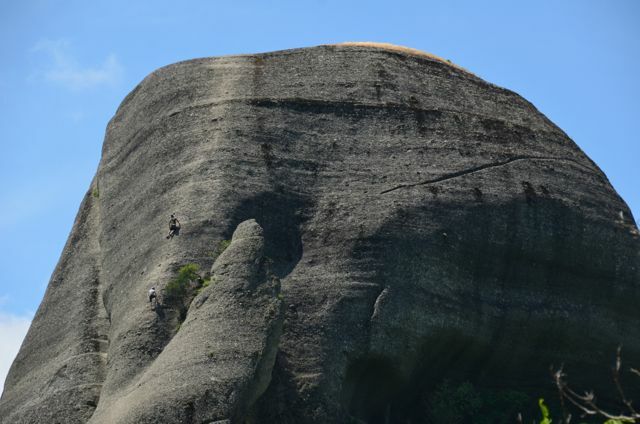 A pair of rock climbers cling to one of the supposedly more-accessible formations. 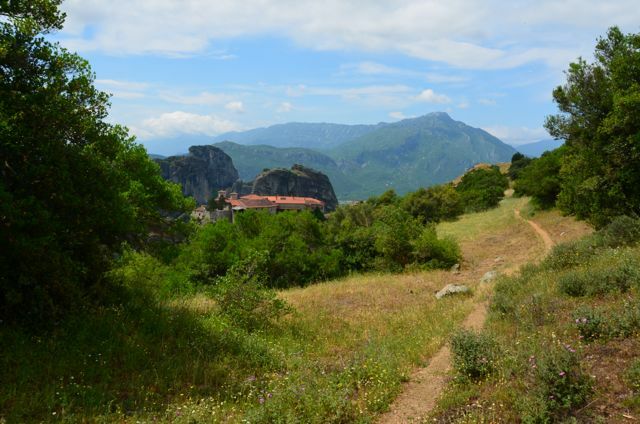 It can be easy to get lost when hiking in the more remote wooded areas around the Meteora Monasteries. Be sure you have a good map, or consider hiring a guide to find those less-trodden paths, which are well worth exploring. The weather was sizzling during our springtime visit, and we were happy to have packed ample water and snacks. 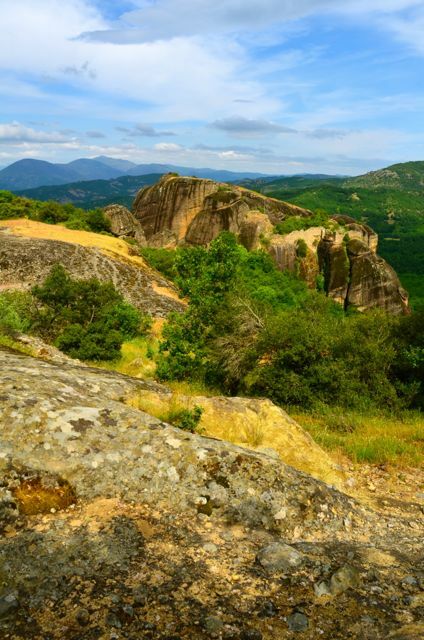 It’s possible to purchase refreshments near some of the more popular monasteries, but because the hike can be long, I recommend bringing your own for the ascent. Accommodation wise, we stayed at the cozy Guesthouse Patavalis (affiliate link) in the village of Kastraki. The hotel’s owner, Marina, whom we dubbed our ‘Greek mama’, surprised us with samples of tasty, home-cooked Greek food like spanakopita, candied figs and milk custard pie. 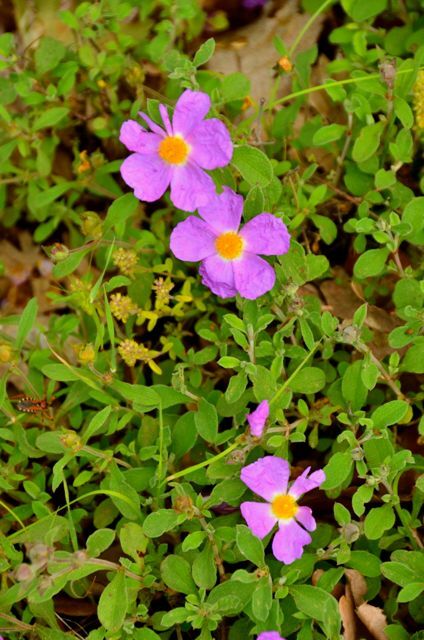 In total, we spent about a week at the Guesthouse Patavalis, staying in its ‘Purple Room’. 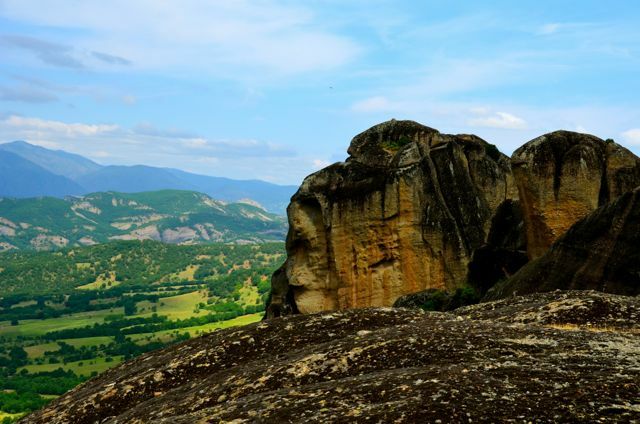 We enjoyed its terrace views of the surrounding rock formations, and its convenient location. 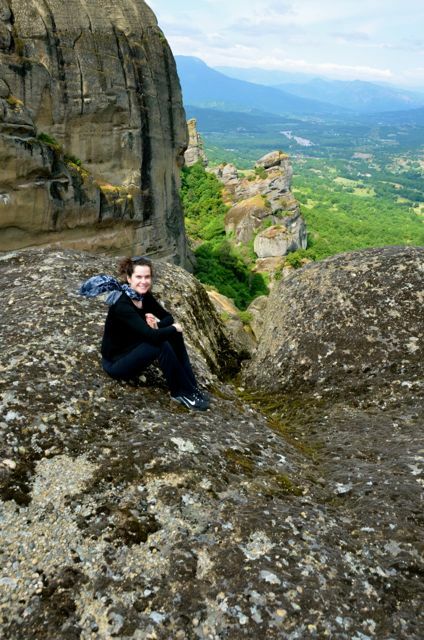 It made a great hub for hiking to, and exploring some of Meteora’s monasteries! 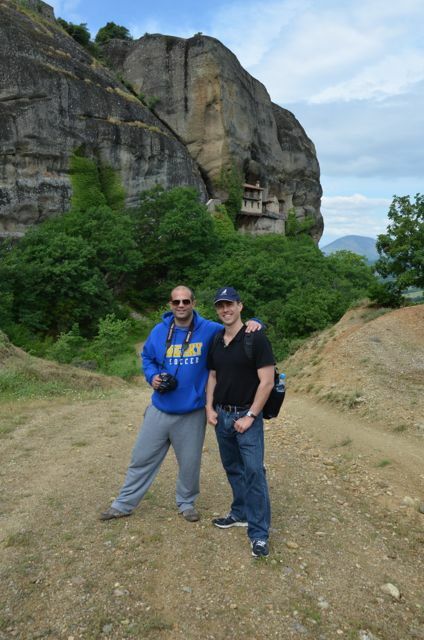 Visit Meteora hosted us for this hiking adventure. ευχαριστώ πολύ/ A big thank you to George for guiding us. 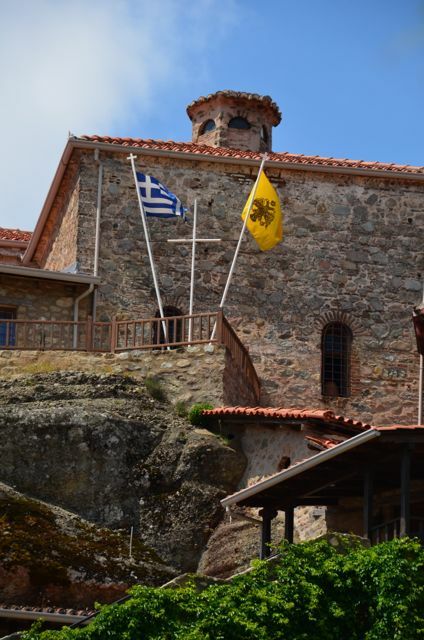 We loved getting off-the-beaten path with you, hearing your insights about these magnificent monasteries and learning more about Greek culture. 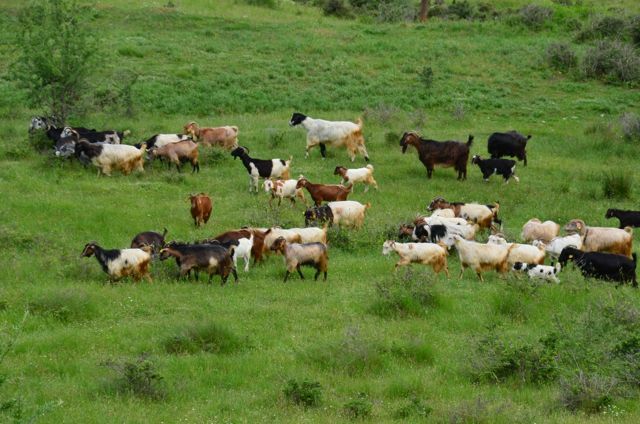 This is another great travel story Tricia. We have not been to mainland Greece, unless you count Lefkas, which is joined to the mainland. 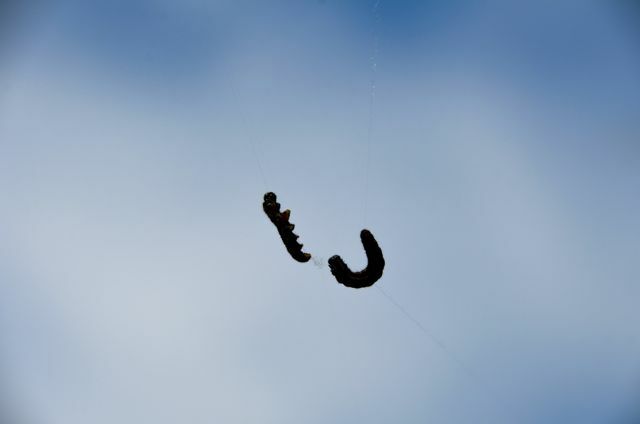 It was on Lefkas many years ago that we also witnessed the springtime mass caterpillar abseil. What puzzled us was that once they hit the ground beneath the cliff, they seemed to make for the sea. Glad you enjoyed it David, thank you. It sounds like many travelers to Greece head straight for the islands, missing the mainland. 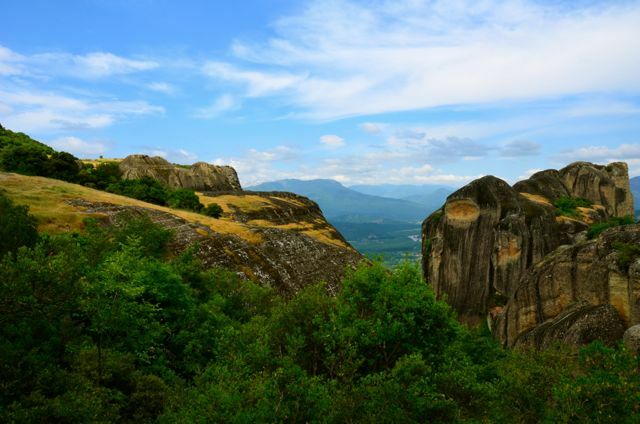 It’s a shame because Meteora’s monasteries and the region are beautiful – mountains, rolling hills, and wonderful wildlife. What an interesting caterpillar observation! I wonder if it was an illusion, or if they were somehow drawn to the water? On a side note, we resumed our morning walks today. We’re trying to get fit to climb one of the local peaks here in Oberammergau. I hope my fear of heights won’t get the best of me! 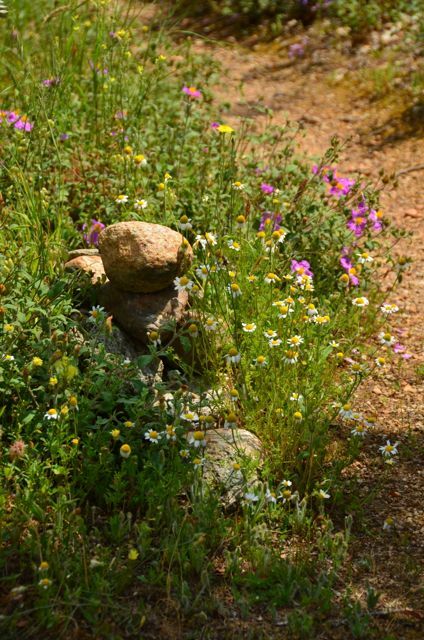 Are you in a spot that allows you to hike out to nature often? 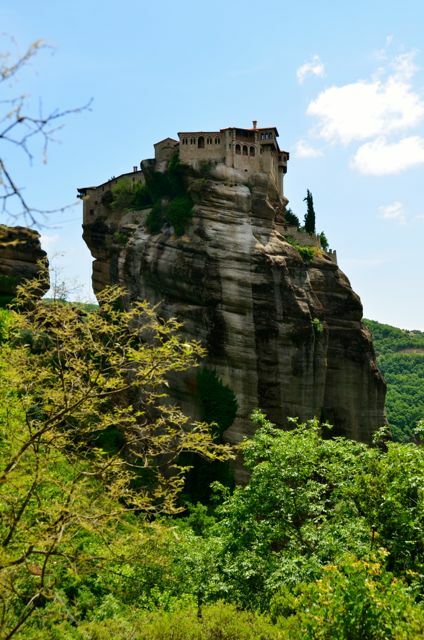 A former colleague told me about Meteora many years ago, and ever since I’ve been intrigued to visit this part of Greece. Meteora wasn’t the easiest to get to from our starting point in Macedonia, so we debated diverting there, but I’m so glad we made the trip. Spending the week there has been one of my travel highlights! A most wonderful post! thank you. V.
Thank you, Vera. Wishing you a beautiful weekend ahead! That is astonishing! Tremendous scenes! 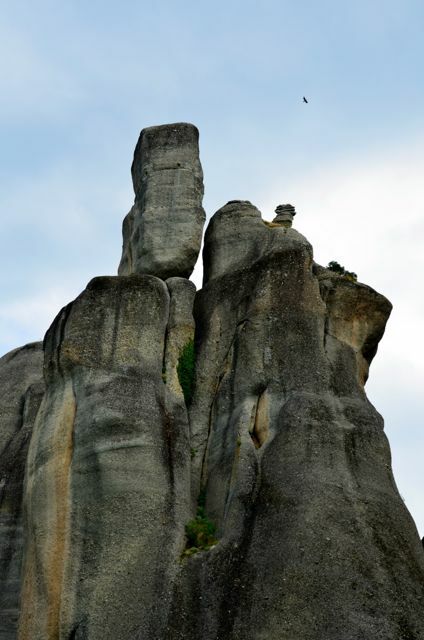 We were lucky to stay near Meteora for about a week, Phil, and never really lost that sense of wonder for the monasteries or the dramatic rocks. Our little guesthouse had a terrace that overlooked them and each day, we’d watch storms rolling in, new rock climbers attempting a climb, or brilliant sunsets. It’s a special place. I am in awe of how people even considered building anything on these virtually inaccessible rock formations. 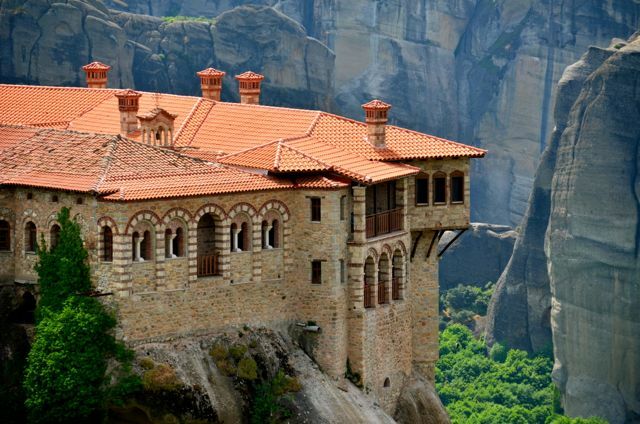 I can conceive of a small cabin, but a huge monastery?! I wonder how many people worked on any given monastery and how long it took them to complete such a structure… some people may have worked on these for an entire lifetime? Thanks for your enjoyable write-up. We had the same questions; I can only imagine how much more dramatic that area looked when there were more than 20 monasteries! In several of the monastery chapels, frescoes depict the torture that some believers encountered, illustrating why the monks decided to build in such unreachable locations. 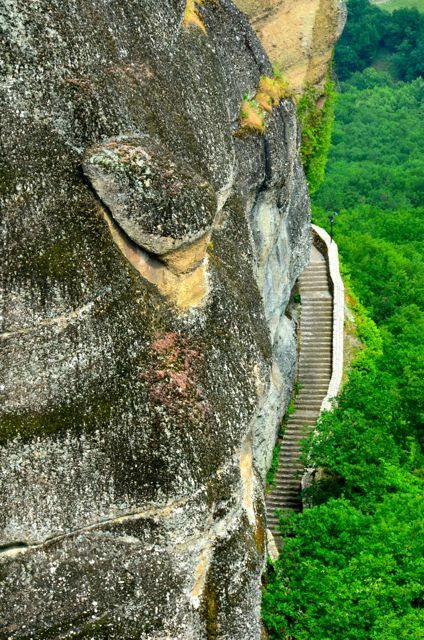 It’s hard to believe that monks regularly rode up in nets until the early 20th century, when stairs were carved out of the rock. It’s astounding that people can build on those locations! Super photos and fascinating information. Thanks. I agree. I’d love to find a documentary that illustrates how the building materials were carried up, hundreds of years ago, Marilyn. We also found it interesting just imagining the logistics of getting food/supplies brought there before the staircases were built in more recent times. 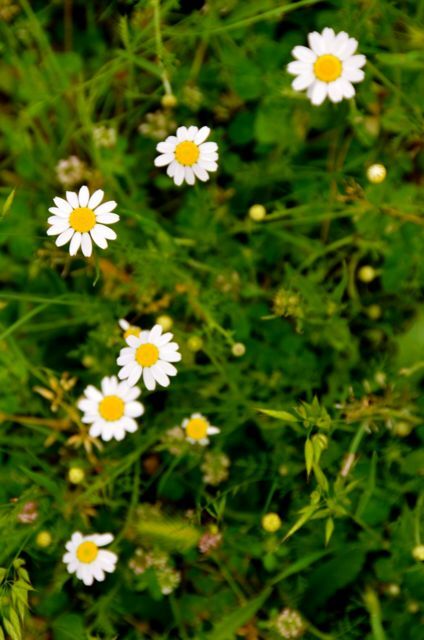 Lovely photos Tricia. I can’t imagine how people build places in those precarious positions. I like your video and your pictures. Your husband is a good narrator. What’s new in NY this weekend? Lynne, now on the day that the viper snake crossed just in front of me on the hiking path, perhaps I would’ve preferred to have been on a bus. :) Our guide was surprised that we saw it during our solo hike, as he’d never encountered one before. Wonderful travelogue! !! 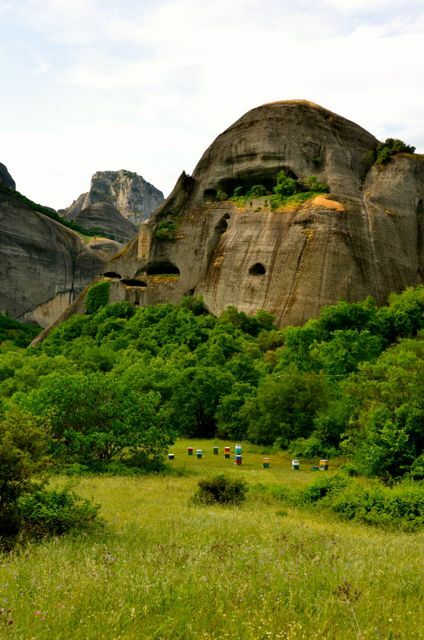 Planning to visit Meteora this May. Do you have the contact details of the guide you hired? Glad you enjoyed the travelogue, Apu. 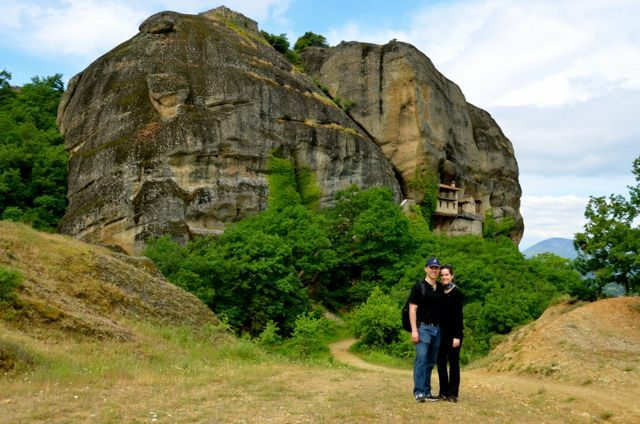 We had an incredible time exploring Meteora, and we hope your trip will be just as memorable. 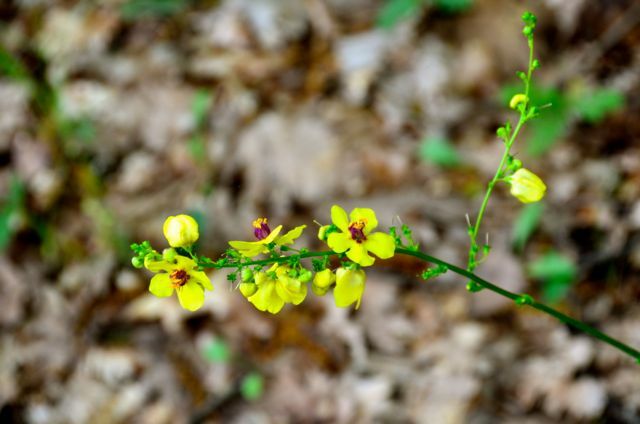 We also went in May, and the weather was beautiful – the flowers were coming alive, the berry trees were producing fruit, and it wasn’t yet too hot. My pleasure, Apu. 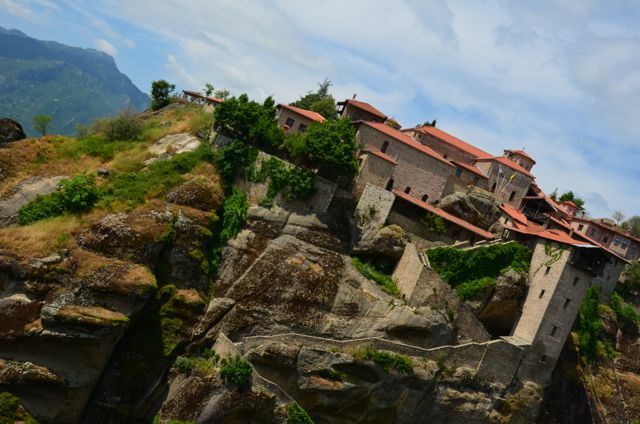 I’m glad that we helped sway you towards beautiful Meteora. I’d love to return someday and explore even more of the area. Some of the neighboring villages also sounded like they had a lot to offer. 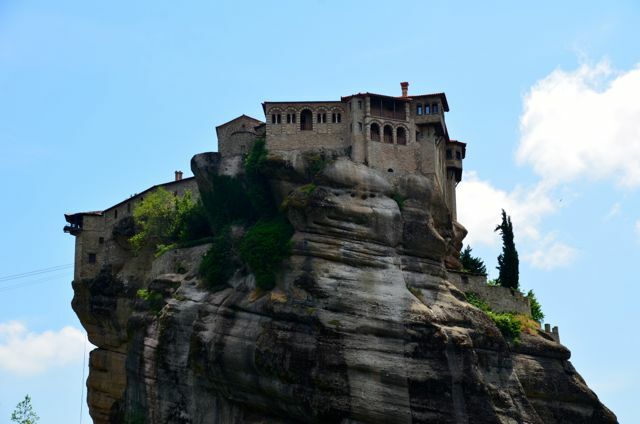 I have been to Meteora many times. The landscape is obviously breath taking. What is not so well known are the frescoes depicting scenes of early Christians being brutally tortured. This is mentioned in the comments of this post. These frescoes twisted my stomach, and they offer an explanation for the monks building there. Volos Taxi Service, indeed, I remember seeing some of those unpleasant frescoed-scenes that you describe. What was especially fascinating to me were the vintage drawings/photographs of monks riding up in the rope basket – a true test of faith. 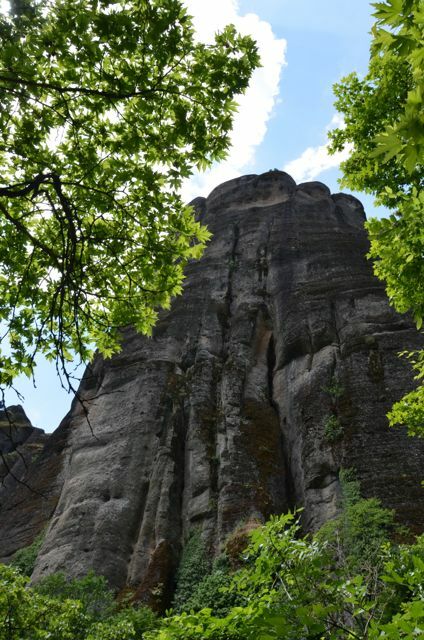 Despite it being a bit of a logistical challenge to get to Meteora, I’m so glad we did it, particularly during the late-spring months. It’s a beautiful part of the world.